Most fans of Shammi Kapoor and this fabulous film are by now painfully aware that no full version of it has made it onto dvd or vcd. Well, fear not! Shalini has shared her videotaped version which is intact (though unsubtitled), and I am here to tell you what we’ve been missing. On the dvd, Sunita (Asha Parekh) and Rocky (Shammi) return from their little excursion having fallen head over heels in love and Rocky discovers that his room has been ransacked while he was away. He realizes that someone is investigating Rupa’s death a year earlier, and is confronted by a jealous Ruby (Helen)—she says cryptically that she hopes that Rupa’s little sister doesn’t find it necessary herself to leap from the third floor to the arms of mother earth. 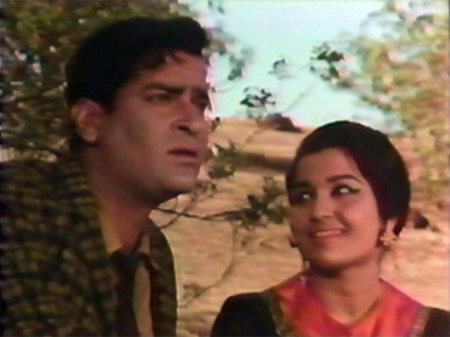 Then suddenly the scene switches to a rural fair, with Sunita and Rocky singing a song on a ferris wheel; and from that point on wealthy Kanwar (Premnath) is suddenly part of the plot and Sunita’s father (Raj Mehra) is also inexplicably present along with Ramesh (Prem Chopra) and his father.